Discover the finest informal dining restaurants across Bangalore, Delhi, Mumbai & Pune (NEW!) through specially curated three-course prix fixe menus at a fraction of a la carte prices. 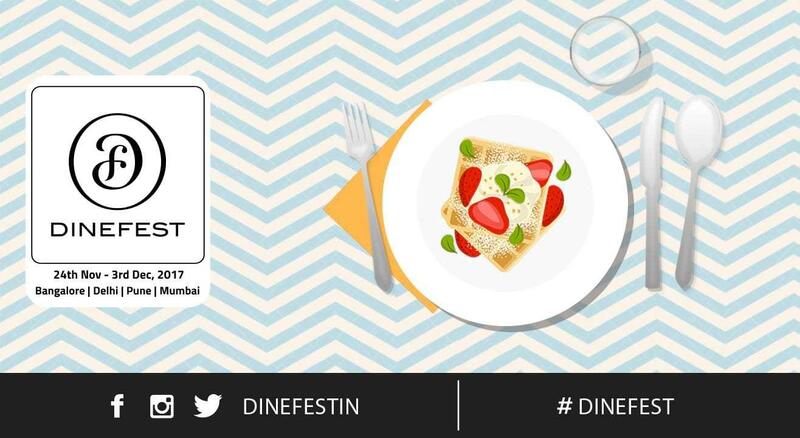 DineFest is a 10-day culinary event showcasing restaurants across 4 cities from 24th November – 3rd December, 2017 – this is the inaugural round in Pune. The menus are priced at INR 600++ across all cities; the pricing is per diner and is exclusive of applicable taxes and government charges. Try a new restaurant, or head over to an old favourite for lunch or dinner! A chance to visit a restaurant you've always wanted to try, at a fraction of a la carte prices. An extensive menu, showcasing the restaurants' best dishes. Fixed price across all restaurants in each city. Created and executed with much passion by Chefs Nachiket Shetye and Mangal Dalal, founders of Mumbai-based Cellar Door, a culinary consulting firm with interest in gastronomic events, restaurant consulting, talent management, product development and research. Their portfolio of culinary events includes Restaurant Week, Chef's Table Week, Small Plates Week and Food With Benefits. - The welcome drink will only be served to customers above the legal drinking age who have made a reservation online. - Select restaurants may accommodate walk-in/a la carte guests under the DineFest menu on request. Please note, such accommodation is as per restaurants' discretion, and the same is not guaranteed to all walk-in/a la carte guests. - The convenience fee will not be adjusted against your bill at the restaurant. - The timings (eg: 1:00 P.M. - 2:30 P.M.) mentioned for each seating refer to the start time and end time respectively of your meal period. - The restaurant will only hold your reserved table for 15 minutes from the start time. Late arrivals may only be accommodated as per the restaurant’s discretion and availability of tables. - This is only a table booking. The meal price, applicable taxes and service charges will have to be paid directly at the restaurant, at the time of the meal. - The meal period will last for the restaurant’s standard seating timings of 90 – 120 minutes. - The price mentioned is the per-head price for the DineFest menu only, and is exclusive of applicable taxes and charges. Beverages and a la carte items will be charged extra. - A smart, casual attire is recommended, each restaurant has their own child policy, we recommend contacting the restaurant regarding the same before you make a reservation. - No take-away or parcels are allowed. - Please carry a valid ID proof along with you. - Security procedures, including frisking remain the right of the management. The sponsors / organizers are not responsible for any injury or damage occurring due to the event. Any claims regarding the same would be settled in courts in Mumbai.